Parts are intersected by simply linking their center lines together using the drag, drop and snap linking in the 3D design system (full version only). The design environment is created specifically to make this process of 3D design as simple as it could possible be. The alternative is to use the library of template designs and simply load a design and type in new dimensions. These designs are pre-created complete with links and intersections. There are special matching procedures that cause the parts to be matched together in various ways to form a valid intersection. 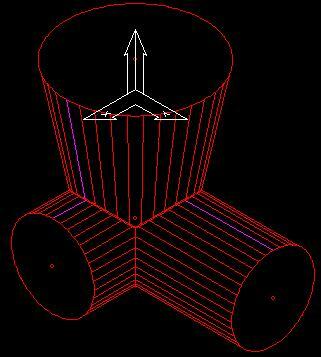 The match between linked parts forms part of the definition of the intersection relationship and in parametric designs is applied each time the dimension values are changed. The intersection, linking information and matching data all define the way the parts join or connect together.